Welcome! We are open everyday except Christmas Day 9am – 3pm. Today will be our last boil of the 2019 syrup season. EASTER: All 4 days of Easter weekend (Good Friday – Easter Monday) we are open 8:30am – 3pm. It is first come, first serve in the pancake house. We only take reservations in the following cases: weekdays (except holidays) for groups of 8 or more and for the 8:30 am seating on weekends or holidays during March and April. Easter Egg Hunt: All 4 days of the Easter weekend from 9am – 3pm. For more information click here! 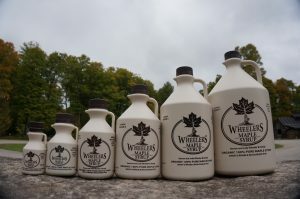 There is so much to see and do at Wheelers all year round! We are open everyday from 9am – 3pm so come enjoy a meal, browse our Maple Heritage Museum and Forest & Farm Museum, look around our sugar camp, hike/snowshoe/cross country ski our nature trails, and buy our beautiful organic Maple Syrup! Here a sneak peak of how we make maple syrup video. There is no admission fee to visit us, tour our museums, and use our trails. The only cost is the meals you order and maple products you purchase. Reservation Policy: Everyone is served on a first come, first serve basis. Weekdays (except holidays such as Good Friday) we take reservations for groups of 8 people or more. We can accommodate groups of any size so bring all your friends! Pet Policy: Only service animals are welcome inside our buildings. Well behaved animals are welcome outdoors as long as they are leashed and supervised. Please ensure your pets are respectful of our other guests and our farm animals. Please note that we do NOT accept debit cards. We do accept VISA and MasterCard. ATM onsite. Hard packed with some mucky spots, depending on the trail. Horse loop excellent walking on a gravel road. Woksis flooded in parts due to spring thaw. *Please follow our signs and written directions. We DO NOT recommend using a GPS once you are within 15km of us as it may take you on unmaintained or narrow backroads. There are plentiful signs from all directions. All the roads to our enterance are paved (except a 2km stretch on Concession 9A if coming from Maberly).